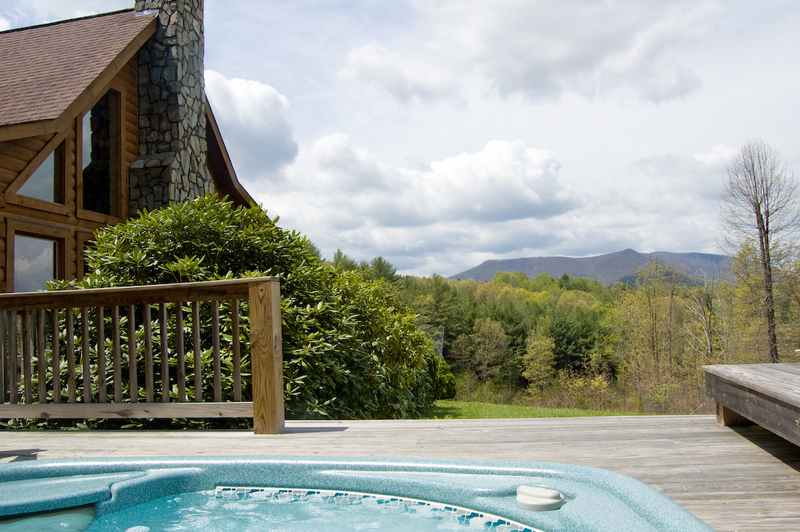 Altitude Adjustment - Sun Deck with Hot Tub. Enjoy the Phoenix Mountain View and starry skies. Sun Deck - Lots of seating outdoors. Kitchen - Fully Equipped, Stove, Refrigerator, Dishwasher, Microwave, Toaster, Toaster Oven and lots of pots, Pans, Dishes and Utensils. Main Level Bedroom - Queen Size Bed and Phoenix Mountain Views from the Windows! Upper Level Bunk Room - Full Size Bottom Bunk, Twin Upper, Chaise Lounge and Bear Rug. Privacy, lots of windows, sun deck and covered porches. This gorgeous log cabin offers privacy, stunning views and plenty of outdoor space to take it all in. 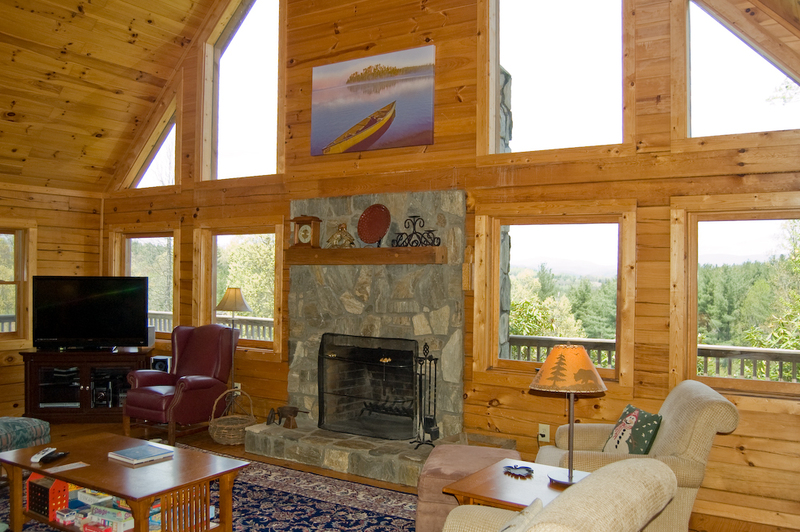 The main level features an open and spacious living area with plenty of seating, a beautiful stone wood-burning fireplace, 47-inch flat screen TV and ample windows and glass doors leading to the expansive deck overlooking the surrounding woods. The well-equipped kitchen offers bar seating and opens onto the dining room which features a farm table and seating for 8. A queen bedroom is also on the first floor, in addition to a hall bath featuring a tub/shower combination. The second floor features two additional bedrooms and a shared full bath with a tub/shower combination. The first bedroom offers sleeping for 3 with a full/twin bunk bed, a cozy chaise lounge and your very own bear skin rug. The second bedroom features a queen bed and a sliding glass door which leads to a small private balcony, offering views of the surrounding woods. On the lower level, you will find a bonus living area complete with a large sectional sofa, an air hockey/ping pong table, and a TV. 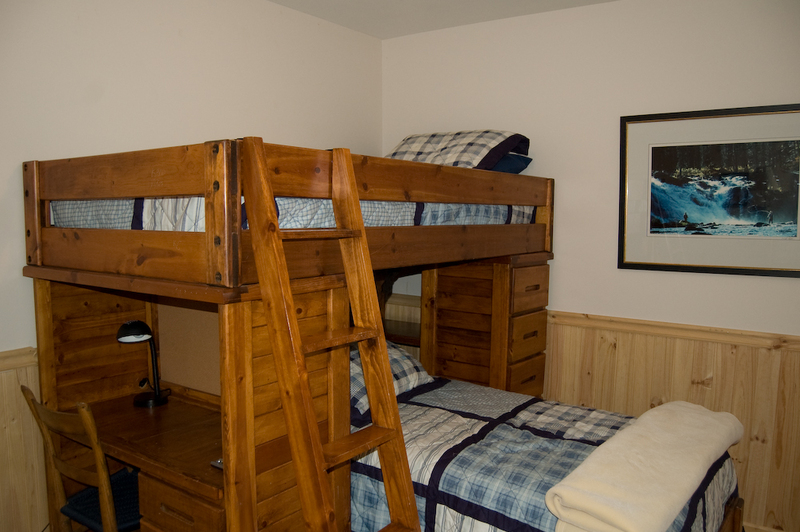 There is also an extra bedroom with bunk beds which offers sleeping for 2. 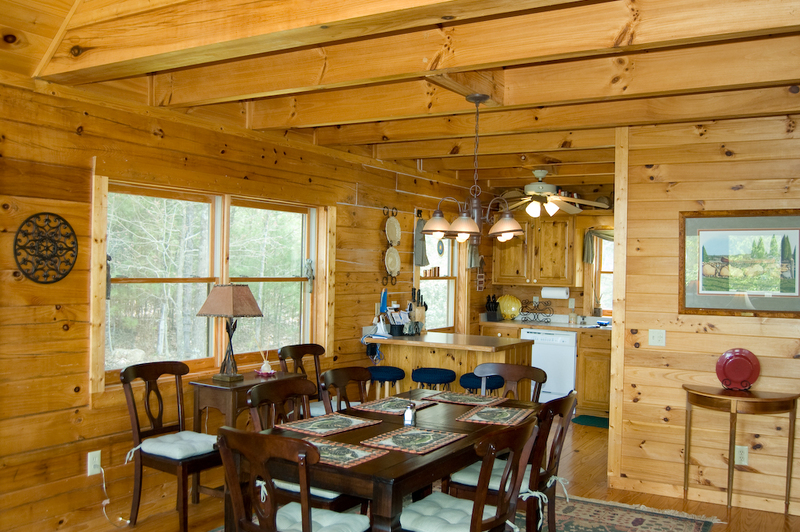 As beautiful as the interior of the cabin is, you will find so many reasons to enjoy the outdoors too. The expansive deck is the perfect place to soak in the outdoors, a hot tub, gas grill, and rocking chairs and tables and chairs for outdoor dining. The large yard is grassy and flat and the perfect place to gather and admire the starry night sky. 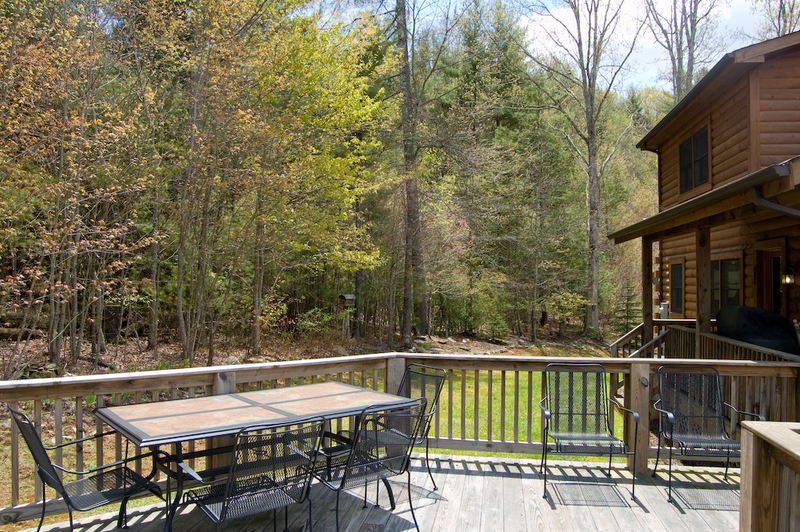 Conveniently located to town, yet perfectly situated to offer the quiet and privacy you desire in a vacation rental, this spacious cabin is sure to be a perfect fit! "A most seamless vacation rental from reserving the property to the checkout process. This property was extremely clean, very well-stocked, and in a great remote setting. We had 2 families (5 adults, 4 children) and had plenty of room. We will definitely be repeats customers, and will highly recommend to friends. I believe a favorite to all was visiting West Jefferson and the Ashe County Cheese Company." "Great week away we enjoyed seeing all the different wildlife while there. More important great time with family! Thank you for sharing your home." "great cabin, great view. Lady in the office was very helpful while we were on vacation"
"We loved every minute of our stay. Just was so kind and took care of us well. " "My family and I cannot say enough great things about the rental property and dealing with Ashe High Country. " Thank you for the wonderful words. It's been a pleasing working with you and your family and we look forward to hosting you again soon! "A BEAUTIFUL VIEW AND MUCH NEEDED RELAXATION"
"We had a wonderful weekend. The home is conveniently located, very clean, and very well stocked (games,puzzles, books, comfy linens, plenty of cookware, comfy seating, etc.). The hot tub was great and the yard was much bigger than expected for a mountain home...the kids in our group had a great time outside and in. I would highly recommend this asap house for one or two families with children to gather and would highly recommend this rental company as well. Very easy to work with and very clean!" Thank you for the feedback, we look forward to hosting you again soon. "We had an extraordinary time at this cabin celebrating Christmas 2017. 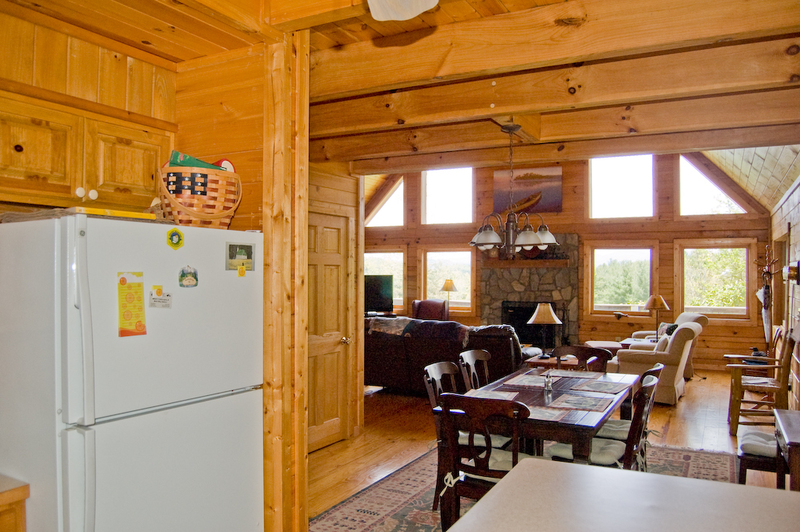 Altitude Adjustment is a well stocked cabin in a secluded area, that can hold eight family members comfortably. We had three adults and five children. 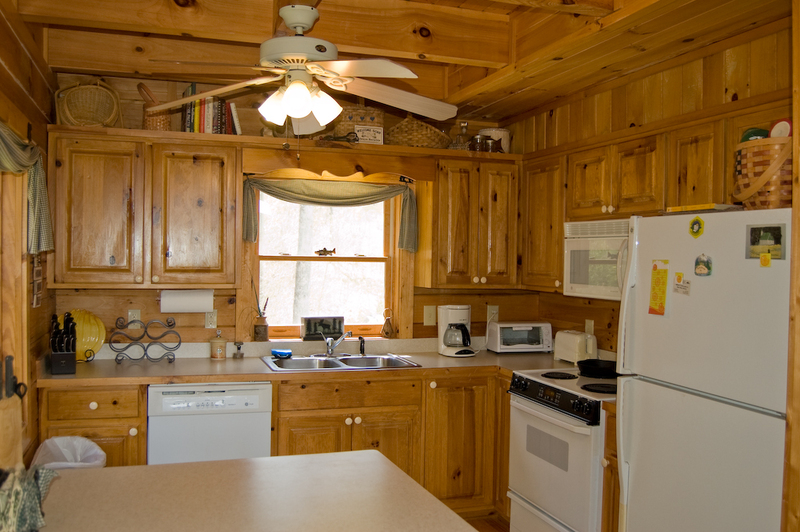 The cabin has everything you need for cooking and day to day living. It is military friendly, discount offered. The cabin is well kept and very clean. " 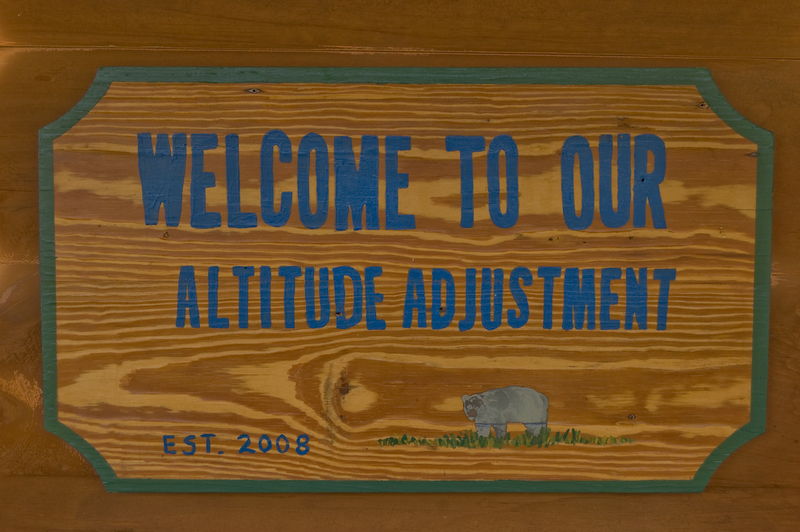 "This was our second stay at altitude adjustment. We like to go up to the mountains for our Christmas tree every year and our family is a large one, so we need a home, not a hotel. I am always impressed with the service given by the property management, they are friendly and very helpful. Weve stayed at other properties of theirs and get the same service (as well as cleanliness). Altitude adjustment is away from any hustle and bustle, the home is so quiet and inviting. They provide games and puzzles for all ages as well as toys for younger boys. The home has room to spread out and a welcoming living room. And, what a view from the hot tub! When we stayed last year, there were a lot of ladybugs in the Home, but this year there were none. We did have some indoor leaking from a heavy rainstorm, but informed the management and hope they resolved the issue. Well probably be back again next year!!" "My husband and I rented this property for our anniversary weekend and had a wonderful stay. The location was easy to get to, yet very private. The view was gorgeous from both the cabin and the deck. It's tastefully decorated and not too cluttered. We enjoyed spending a rainy day inside in front of the fireplace and also an evening watching the sun set from the hot tub on the deck. 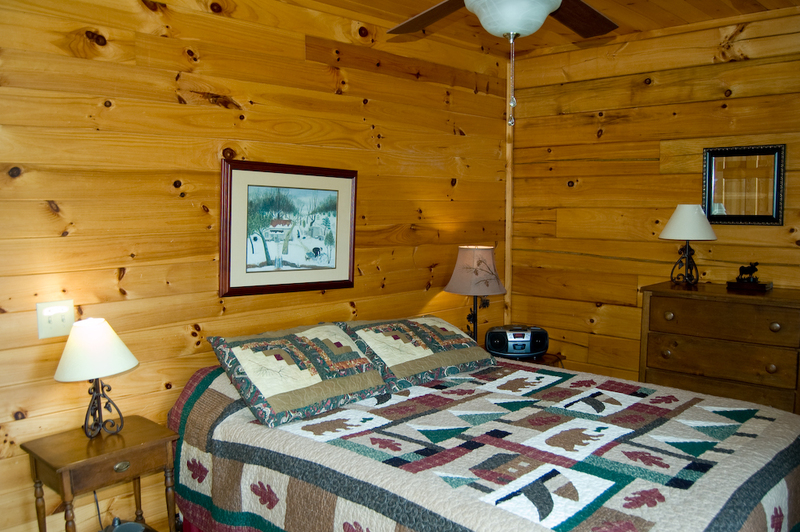 The cabin was very clean (something I am very picky about) and the sheets on the bed were a really good quality. The only negatives were that the towels could stand to be a nicer quality and the furniture is definitely to the point of needing to be replaced. The sofa was so uncomfortable that I could not even sit on it. Hoping that the living room furniture is updated because we would love to return for another visit to this beautiful cabin. "Beautiful property, very clean. Management company was very helpful with any questions. Great location, very private and easy to get to. Would love to come for a stay again. " "We really enjoyed staying at this home for our vacation with grandchildren. The views from the living area and the deck surrounding the house are wonderful and we had beautiful sunsets each evening. We would definitely stay here again. " "What an amazing cabin! Everything you could need to a mountain get away! We will be staying here again in the future! Si peaceful amd relaxing. And what a value for the price we paid. Ashe properties was amazing to rent with as well! " "First thing, have to give kudos to Charlie the housekeeper. She allowed us to drop off our kayaks and store our food before check in time so we could go fly fishing all day! The place was immaculately clean. Well stocked with everything you needed. The only thing, and I'm being a little picky...some real curtains in the bedrooms would be nice. They basically are just sheers and keep zero light out. If you are an early riser, perfect. But, if you are on vacation and want to sleep in a little, not going to happen. You are 2 minutes from world famous Shatley Springs restaurant. Unfortunately our visit there was less than acceptable. All our food was cold. I have been going there for 50 years. It has gone way downhill. They are serving a new brand of country ham that is about half the width has previous ham. More like something you would get at Bojangles vs what they use to serve. "For anyone looking for a quiet getaway, this is a great property. We look forward to returning. " 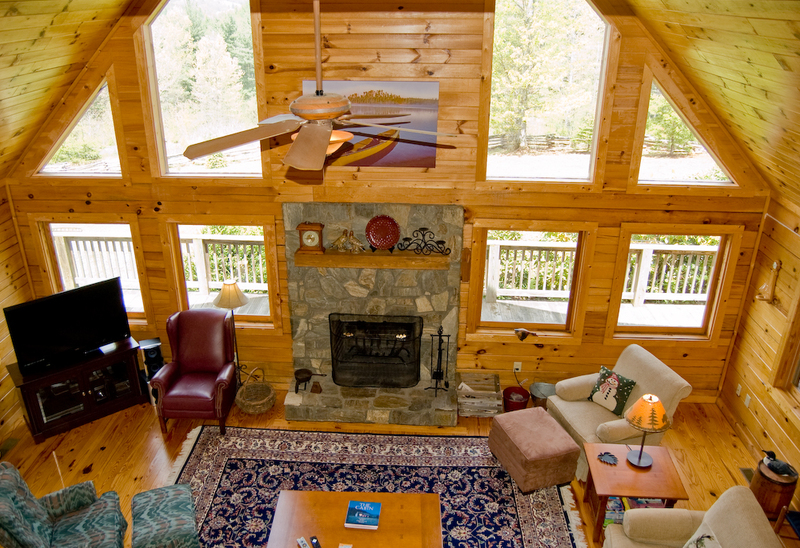 "From booking to checking out, the process was easy and the cabin was beautiful. The only thing I would change is the lady bugs and some curtains or blinds on the main floor. I'm a private person and prefer the windows to be covered when the sun goes down. 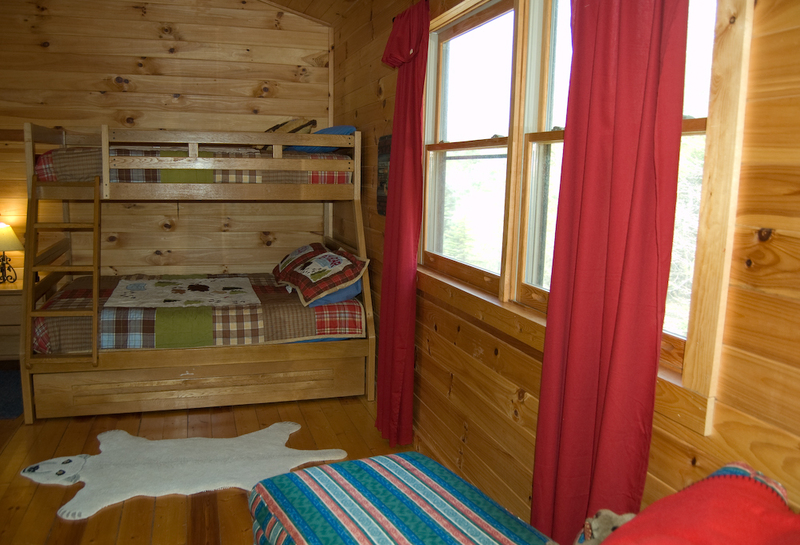 The cabin was very clean and cozy, but there seems to be a lady bug problem that put us off a bit. Overall, we had a super time. " "Everything was Great! Lovely cabin wonderful views. Awesome Fire Place!!" "The property is high up in the high country. It is about 20-25 minutes from West Jefferson. You will be surrounded by nature, mountains, and quiet. The sunrises and sunsets will bring you to the porch and make you stay a lot longer than you had planned. They are just perfect. Everything was in good condition and as described." 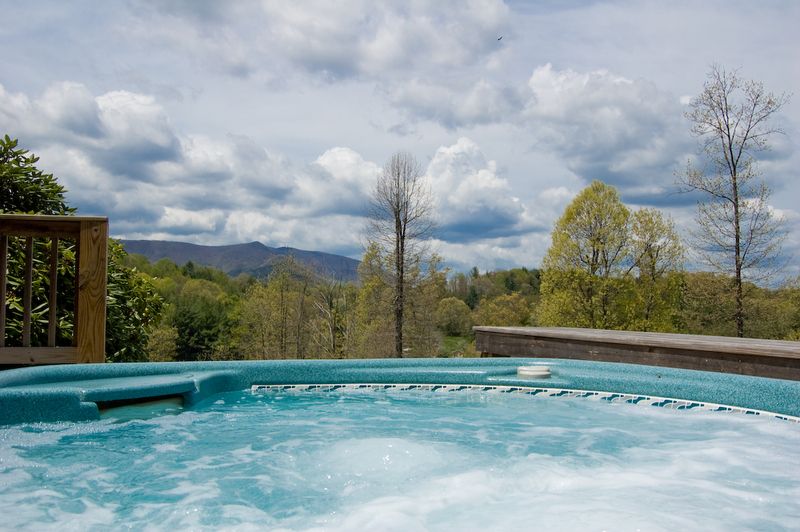 "this is the second time booking with ashe county vacations. they go above and beyond! we rented this cabin for the weekend and as soon as we showed up, we wish we could stay longer! tons of stuff for the kid to do. puzzles, games for all ages, toys and air hockey! plenty of space for our family of 7. we go up to get our Christmas tree each year and we will be looking forward to staying longer in 2017!!! home was very clean, had some lady bug friends.. but the kids didn't mind a bit. please be advised, you do have to take your garbage when you leave, as the county doesn't offer trash pick up. " 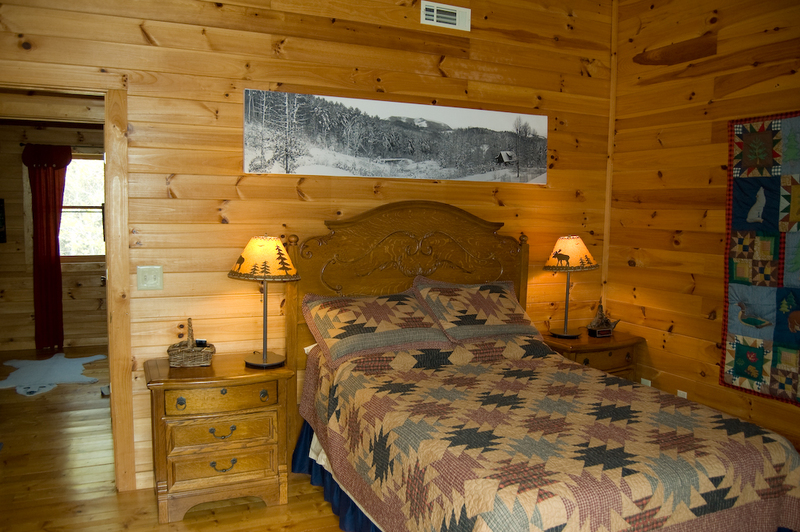 "We were impressed with Altitude Adjustment log cabin. It is a beautiful place with awesome view of mountains and so quiet and peaceful...but yet just 10 minutes away is a grocery store and the town of West Jefferson." Thank you for your review. We are happy that you enjoyed your trip! "We were 6 adults and booked this cabin for Memorial Day weekend. We booked for 2 nights. Location is excellent as you can see mountains from those cabin. It's on top of the hill so we got our own big space without any disturbance. I would definitely recommend this cabin. There is plenty of space for sleeps. It's actually better than photos ! " "Some of the towels are faded and old. We could not find the puck for the air hockey so that was disappointing. Firewood supply was low. If we stayed another night we would not have been able to make a fire." "This cabin wish so wonderful!! The views were incredible loved seeing all the views. The cabin was super clean and huge and plenty of room for a big family. We even had snow and the kids were able to sled on the hill out front. Wish we could have stayed longer, two nights wasn't long enough here. " "We were a little nervous about renting a cabin in the Winter due to roads and access.... but this was the perfect one. This cabin was clean, well appointed, great fireplace and easy access from the main road, while providing complete privacy and nice long range views. " 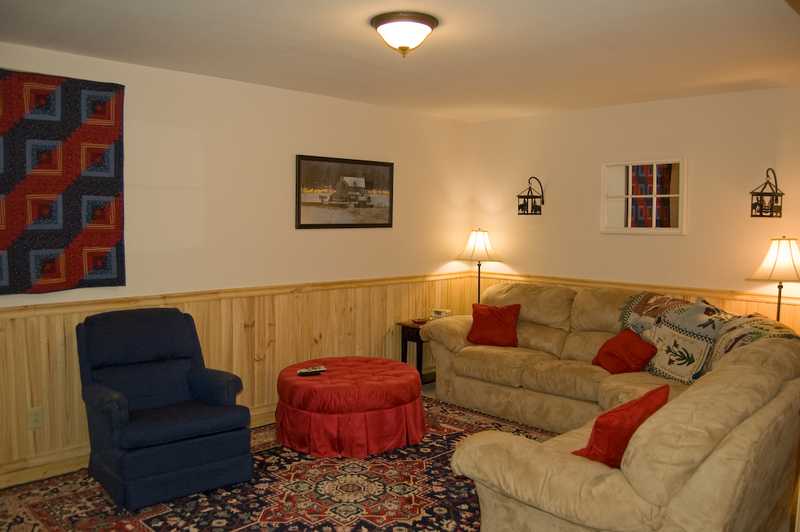 "We all enjoyed our stay and the place was clean and comfortable. The hot tub was so much fun on these cold Winter days...the only draw back is driving so far to take the trash away. Perhaps the instructions were wrong? The map was very vague, and the round trip took 45 minutes. Not a fun way to end a great stay." "My family loved this cabin. It is three full floors and adequate space for three families. We loved the views from the hot tub. Awesome!" "This place was so beautiful. I would highly recommend it to anyone looking for a relaxing stay in the mountains. Everything was clean and easy to access. The cabin itself was gorgeous and the view was extremely beautiful. My only regret is that it isn't very close to many if the attractions you might want to visit in your stay. " "Enjoyed our visit. Spacious and well located to visit New River State Park and neighboring areas." "We enjoyed our stay even with drenching rain. Our last morning the sun came out and we could appreciate the beautiful views out the from those gorgeous windows as spacious porches as well. Lovely, clean mountain lodge." "Property was very nice, even though the weather did not cooperate, all had a very nice time." "I called Ashe High County Vacation on a whim, Thursday afternoon , looking for a property for the next day, and through the a matter of minutes, the property manager presented me with four beautiful homes, that had everything I requested. Altitude Adjustment was perfect in every way.We enjoyed it so much we extended our stay, one more night. we cant wait to stay there again." "My family LOVED the cabin! It was a great layout and beautiful mountain views. The cabin was also equipped with everything we needed. My only suggestion is maybe a umbrella for the table near the hot tub as there is no shade from the sun to hang out there and we couldn't enjoy the hot tub at night as it is VERY dark on the side of the house near the hot tub. I would suggest some portable outside lamps or several deck solar lights. Other than that the cabin was AWESOME!" "Beautiful cabin nestled in the mountains just above Shatley Springs. Loved by all of us. " "Out of state friends and family enjoyed NC experience while attending App State graduation." "Really enjoyed our stay. Had plenty of space in the living room to hang out with the whole group and the place had tons of games that we took full advantage for. Thanks for a great weekend." "Really enjoyed our quiet weekend getaway at this cabin. The view absolutely beautiful, very nice big hot tub and large deck area. Plenty of sleeping space and cooking equipment. Also has Wifi despite the rural location. There was a lamp that was apparently previously glued together that feel apart when we tried to turn it on and the air hockey table needs its legs tightened to make it more stable, but otherwise everything was really nice! If you go, eat at Coyote Kitchen, it was delicious!" "We took our grown son and his family with 4 children for a stay in the mountains between after Christmas. The house was perfect for us all! Well equipped and comfortable. The views were magnificent! " " I had a hard time finding a cabin that met my family's requests: Private location, spacious, mountain views, easy access in inclement weather, wood burning fire place, hot tub, WiFi, affordable, and a reasonable driving distance to ski. Altitude Adjustment met them all! The cabin was clean, well equipped and beautiful. Before we arrived, I was afraid I had chosen a place that was too remote but grocery shopping and the very quaint little town of West Jefferson was only about 15-20 minutes away. We enjoyed several trips to Boone and took a day trip to Asheville to tour the Biltmore. Our favorite however, was a hike with the wild ponies at Grayson Highlands State Park in Virginia - about 45 minutes north. "We were a little nervous after we had made the reservation due to the cold front that was going to be moving through but we got to see snow for the day. It was great! We were sitting in the hot tub watching the snow fall with the beautiful mountain views in the background." "Much needed relaxing escape to quiet solitude. Thoroughly enjoyed viewing fall colors and not having to do anything." "We would be able to use the cabin more if it had 2 queen beds. Several rocking chairs on the front porch were not in good condition and should be replaced. "The property is well kept and very clean. We thoroughly enjoyed our stay. The setting is rural and the views are breathtaking. (There are these birds...they rap on the windows in the evening and the early morning hours. I have never seen anything like it! Although, they could be anoying, we loved it. The cardinal was beautiful!) There was plenty of parking space and lots of room inside for our large family of 8 adults. The kitchen was small, but the table in the dining area expanded to seat everyone. The basement bedrooms seemed slightly damp, which is not unusual for room underground, but a dehumidifier may help that. The internet was patchy, and we ran out of paper towels and trash bags. (Maybe we were supposed to bring our own?) Regardless, when we called the property manager, the internet issues were resolved through the server and they brought out more trash bags and paper towels. We would stay here again! We love 5 Star Reviews! We do offer a starter supply of paper products, etc., per the check-in instructions detailed items to bring are included. Not sure what to bring, always feel free to ask! "My group had an amazing time at Altitude Adjustment. The location was great (just a few minutes from town) but isolated enough that we were able to relax in peace. HIghly recommend and would definitely stay there again." "My family had a WONDERFUL time. It was very spacious and the yard was great or hanging around outside!!! We will definitely be renting again!" "This cabin was so well equipped. We are big cookers and it was like cooking at home. Very impressed. It also had a lot of games and puzzles for the kids, just nice to know you don't have to bring the extras. We had a great time." and there it was. There was plenty of firewood for us to keep the fire stoked during the evenings. 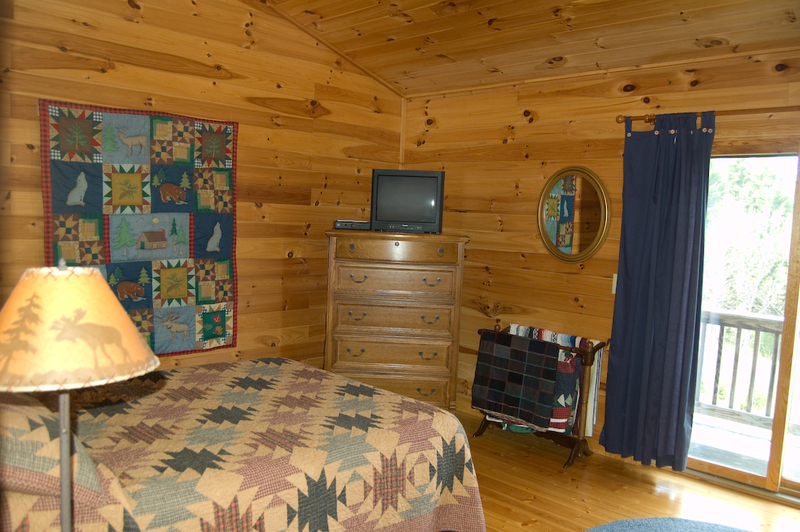 The cabin was well cared for, but not overdone allowing everyone to be comfortable and to relax. We took a few visits to Boone, which was about an hour away, and had grocery stores, and a Wall Mart less than 10 miles away. Hope to visit again. Thanks for a great stay!!" "Had everything we needed and slept 9 of us with no problem. Hot tub was hot and clean. Kitchen was well stocked. Beds were comfy. There was only 5 pieces of firewood so if you want a fire bring your own - the fireplace was nice thou. Plenty of room for my family (there was 9 of us). Lots of seating, etc. Internet was fast. A+"
"Good location, clean home, great amenities, however the house was infested with large black flies and that spoiled the experience for female members of our group. Dead flies were found everywhere and the buzzing at night kept people awake. I would suggest the property manager to hire an exterminator to tackle the flies issue." Fly issue is being addresssed and should be resolved before next guests, unfortunately the cold weather brings them inside. "Great cabin, we'll be back!" "Nice and very clean home. Beautiful views. Enjoyed spending time outside." "This is a lovely place to go for a quiet getaway. Regardless where you are in the cabin you can see a view of the sky, mtn and the outdoor surroundings which I enjoyed during the day but can be a little uncomfortable at night." Fall is almost here and with that comes the cooler evening weather, be sure to pack a light jacket or sweater! "No complaints really, but would say the view was not quite as nice as some others we've been to. Also would have been nice to have upgraded sound for tv when watching DVDs. Other than these minor things we loved the place. We plan to come back. Thanks"
"My wife and i felt it was like being at home. The home was great, clean and easy to get to. The only suggestion would be to update the main bedroom bed to a newer bed and possible King Size." "We really enjoyed this home and location. The home was clean and cozy. 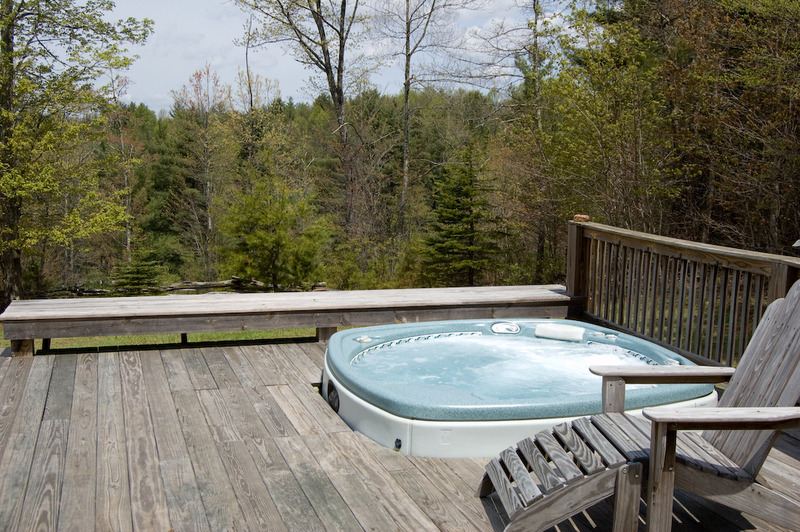 The deck with the hot tub was very nice and offered such beautiful views." "This may be a mountain thing but we were chewed up by almost invisible bugs which were outside and also inside. The realty company was great to work with but perhaps a little too laid back, Overall, great experience with the house." Mountain Life, Mountain Time is Laid Back, Come See What It's All About! As far as the "no see 'ems" unfortunately I think the rainy weather must have brought them out, typically we don't see this as an issue. 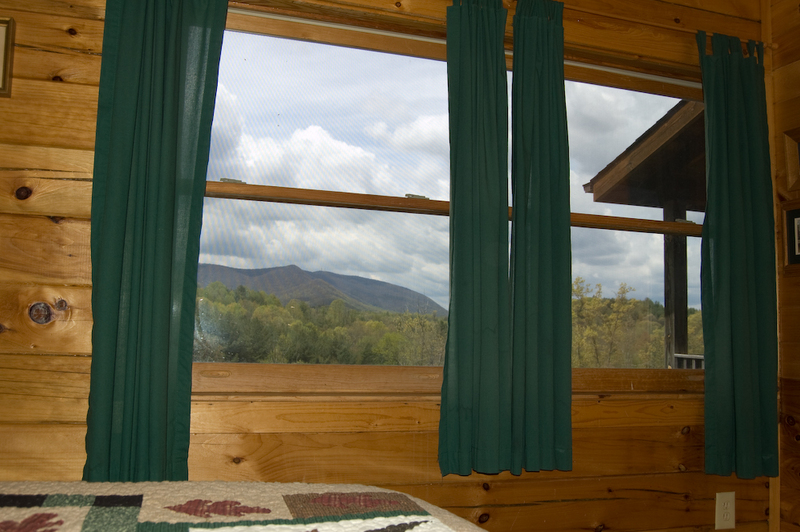 "This cabin has the best views of any cabin we've ever visited! No matter where you sit in the great room, there's a mountain view. However, only one burner on the grill works. The other two wouldn't light. Fortunately it was only myself and my husband and we weren't grilling for a crowd. The dvd/tv in the basement also makes an intermittent humming sound when you try to watch a movie. Its an old school tv and probably needs to be replaced. Not sure what size beds were described in the listing, but the upstairs bed is a full and not a queen. Overall the house was clean and had what we needed. It's nothing fancy but it's private,clean, and 2 minutes from Shatley Springs Restaurant. Can't beat that! Amazing Views, Nicely Furnished and New Grill in Place. "We enjoyed the indoors since it was raining for the most part. Played a lot of air hockey. Very quite environment and beautiful landscaping. " "My wife and I stayed for 5 days in June, 2013. We loved the property and the location. The house is large with 4 bedrooms on 3 levels. It was clean and tastefully decorated. It is one of the nicest rentals we have stayed in and we visit the area at least twice a year. Beautiful living room with great long range mountain views. Lots of windows. Plenty of deck space. The house is nearly secluded with only one home slightly in view. Normally we venture out, hike and roam. We did not do that much here because we didn't want to leave the property, it was so peaceful and beautiful. We spent hours watching the changing skyline. 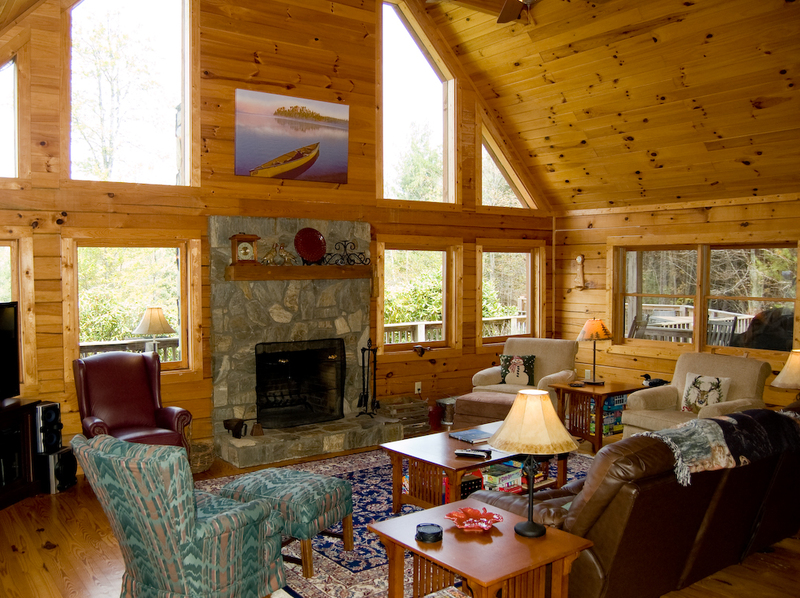 We have rented from Ashe High Country Vacations several times. The service is always professional and personal. Highly recommended! "